A pesar de su prevalencia, el acné ha sido históricamente una de las patologías más extendidas y de más difícil tratamiento. En el pasado, los Dermatólogos han usado todo tipo de técnicas para tratar el Acné, como la abrasión, excisiones, etc., no siempre con muy buenos resultados. Durante la década de los 80 una nueva técnica comenzó a proporcionar resultados muy alentadores. Se trataba de la aplicación del Láser sobre las zonas afectadas. La Dra. Alster, del Washington Institute of Dermatologic Laser Surgery y Georgetown University y sus compañeros fueron pioneros en la aplicación de Laserterapia para el tratamiento de estas patologías. Desde entonces, los avances en la aplicación de Laserterapia en Dermatología han sido extraordinarios. Hoy día ya es posible tratar una gran parte de las enfermedades cutáneas y defectos congénitos, incluidas lesiones vasculares y pigmentaciones, con una técnica que es rápida, efectiva y sin apenas efectos secundarios indeseados. El American Academy of Dermatology es la Institución Médica más importante en el campo de la Dermatología en Estados Unidos. La Dra. Tina Alster es una de las autoridades mundiales en el campo de la Dermatología. Alster TS, Kohn SR. Dermatologic lasers: Three decades of progress. Int J Dermatol 1992; 31: 601-610. Rosenbach A, Alster TS. Cutaneous lasers: A review. Ann Plast Surg 1996; 37: 220-231. Alster TS, Lewis AB. Dermatologic laser surgery: A review. Dermatol Surg 1996; 22: 797-805. Alster TS. Laser treatment of hypertrophic scars, keloids, and striae. Dermatol Clin 1997: 419-429. Alster TS. Cosmetic laser surgery. Advances in Dermatology. St. Louis: Mosby -Year Book, Inc. 1996; Vol. 11: pp. Alster TS, Bettencourt MS. Review of cutaneous lasers and their applications. South Med J 1998; 91: 806-814. Alster TS. Cosmetic Laser Surgery. In Dzubow LM (ed). Cosmetic Dermatologic Surgery. Philadelphia: Lippincott-Raven, 1998, pp. 147-161. Alster TS, Lupton JR. Lasers in dermatology: an overview of types and indications. Am J Clin Dermatol 2001; 2: 291-303. Tanzi EL, Lupton JR, Alster TS. Review of lasers in dermatology: Four decades of progress. J Am Acad Dermatol 2003; 49: 1-31. Alster TS, Garg S. Treatment of facial rhytides with a high-energy pulsed carbon dioxide laser. Plast Reconstr Surg 1996; 98: 791-794. Alster TS, Kauvar ANB, Geronemus RG. Histology of high-energy pulsed CO2 laser resurfacing. Semin Cutan Med Surg 1996; 15: 189-193. Matarasso S, Hanke CW, Alster TS. Cutaneous resurfacing. Dermatol Clin 1997: 569-582. Formica K, Alster TS. Cutaneous laser resurfacing: A nursing guide. Dermatol Nurs 1997; 9: 19-22. Alster TS, West TB. Effect of topical vitamin C on postoperative CO2 laser resurfacing erythema. Dermatol Surg 1998; 24: 331-334. West TB, Alster TS. Improvement of infraorbital hyperpigmentation following CO2 laser resurfacing. Dermatol Surg 1998; 24: 615-616. Alster TS, Nanni CA, Williams CM. Comparison of four carbon dioxide resurfacing lasers: a clinical and histopathologic evaluation. Dermatol Surg 1999; 25: 153-159. Manaloto RMP, Alster TS. Erbium:YAG laser resurfacing for refractory melasma. Dermatol Surg 1999; 25: 121-123. Alster TS. Clinical and histologic evaluation of six erbium:YAG lasers for cutaneous resurfacing. Lasers Surg Med 1999; 24: 87-92. Alster TS. Cutaneous resurfacing with CO2 and erbium:YAG lasers: preoperative, intraoperative and postoperative considerations. Plast Reconstr Surg 1999;103: 619-632. Horton S, Alster TS. Preoperative and postoperative considerations for cutaneous laser resurfacing. Cutis 1999; 64: 399-406. Walia S, Alster TS. Prolonged clinical and histologic effects from CO2 laser resurfacing of atrophic acne scars. Dermatol Surg 1999; 25: 926-930. Alster TS, Lupton JR. An overview of cutaneous laser resurfacing. Clin Plastic Surg 2001: 37-52. Alster TS, Lupton JR. Erbium:YAG cutaneous laser resurfacing. Dermatol Clin 2001: 453-466. Tanzi EL, Alster TS. Treatment of atrophic facial acne scars with a dual-mode erbium:YAG laser. Dermatol Surg 2002; 28: 551-555. Tanzi EL, Alster TS. Single-pass CO2 vs. multiple-pass Er:YAG laser skin resurfacing: a comparison of postoperative wound healing and side effect rates. Dermatol Surg 2003; 29: 80-84. Alster TS, Bellew SG. Improvement of dermatochalasis and periorbital rhytides with a high-energy pulsed CO2 laser. Dermatol Surg 2004; 30:483-487. Alster TS, Doshi SN, Hopping SB. Combination surgical lifting with ablative laser skin resurfacing: a restrospective analysis. Dermatol Surg 2004; 30: 1191-1195. Alster TS. Electrosurgical ablation: a new mode of cutaneous resurfacing Plast Reconstr Surg 2001; 107: 1890-1894. Romero P, Alster TS. Skin rejuvenation with CoolTouch 1320nm Nd:YAG laser: the nurse's role. Dermatology Nursing 2001; 13: 122-127. Alster TS, Lupton JR. Are all infrared lasers equally effective in skin rejuvenation. Sem Cutan Med Surg 2002; 21: 274-279. Tanzi EL, Williams CM, Alster TS. Treatment of facial rhytides with a nonablative 1450nm diode laser: a controlled clinical and histologic study. Dermatol Surg 2003; 29: 124-128. Tanzi EL, Alster TS. Comparison of a 1450nm diode laser and a 1320nm Nd:YAG laser in the treatment of atrophic facial scars: a prospective clinical and histologic study. Dermatol Surg 2004; 30:152-157. Alster TS, Tanzi EL. Improvement of neck and cheek laxity with a non-ablative radiofrequency device: a lifting experience. Dermatol Surg 2004; 30: 503-507. Doshi SN, Alster TS. Combination radiofrequency and diode laser for treatment of facial rhytides and skin laxity. J Cosmet Laser Ther 2005: 11-15. Alster TS, Kurban AK, Grove GL, et al. Alteration of argon laser-induced scars by the pulsed dye laser. Lasers Surg Med 1993; 13: 368-373. Alster TS. Improvement of erythematous and hypertrophic scars by the 585 nm pulsed dye laser. Ann Plast Surg 1994; 32: 186-190. Alster TS, Williams CM. Treatment of keloid sternotomy scars with 585 nm flashlamp-pumped pulsed dye laser. Lancet 1995; 345: 1198-1200. Alster TS, West TB. Resurfacing of atrophic facial scars with a high-energy, pulsed carbon dioxide laser. Dermatol Surg 1996; 22: 151-155. Alster TS, McMeekin TO. Improvement of facial acne scars by the 585 nm flashlamp-pumped pulsed dye laser. J Am Acad Dermatol 1996; 35: 79-81. Alster TS, West TB. Treatment of scars: a review. Ann Plast Surg 1997; 39: 418-432. Alster TS, Handrick C. Laser treatment of hypertrophic scars, striae, and keloids. Seminar Cutaneous Med Surg 2000; 19: 287-292. Lupton JR, Alster TS. Laser scar revision. Dermatol Clinics 2002; 20: 55-65. Alster TS, Tanzi EL. Hypertrophic scars and keloids: a review of etiology and management. Am J Clin Dermatol 2003; 4: 235-243. Alster TS, Nanni CA. Pulsed dye laser treatment of hypertrophic burn scars. Plast Reconstr Surg 1998; 102: 2190-2195. Alster TS, Lewis AB, Rosenbach A. Laser scar revision: comparison of CO2 laser vaporization with and without simultaneous pulsed dye laser. Dermatol Surg 1998; 24: 1299-1302. Alster TS, Lupton JR. Laser scar revision. Dermatol Clin 2002; 20: 55-65. Alster TS. Laser scar revision: comparison study of 585-nm pulsed dye laser with and without intralesional corticosteroids. Dermatol Surg 2003; 29: 25-29. Bowes LE, Alster TS. 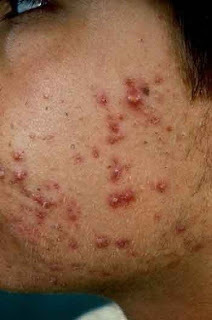 Treatment of facial scarring and ulceration resulting from acne excoriÈe with 585nm pulsed dye laser irradiation and cognitive psychotherapy. Dermatol Surg 2004; 30: 936-938. Para el acné severo no sirven de nada las cremas, la mejor solución natural, es tomar zumo de zanahoria, o zanahoria en pastillas, también omega 3 aceite de hígado de bacalao, no comer chocolate, ni alimentos grasos como bacón o fiambre, no tomar leche entera, cuidado con la comida rápida y con la bollería industrial. El beta-caroteno que se encuentra en la zanahoria, hace que la piel quede más seca y los omega 3 consiguen un mejor riego sanguíneo, con lo que conseguimos menos acné. Si la situación es más grave, debemos acudir a un dermatólogo, ya que existen tratamiento muy efectivos con medicamentos, como el Roacutan, pero que solo deben utilizarse en el peor de los casos. PD: Animo, con estas soluciones, en unos meses te olvidaras del acné! !